Here's another quick and low effort scrapbuster project. 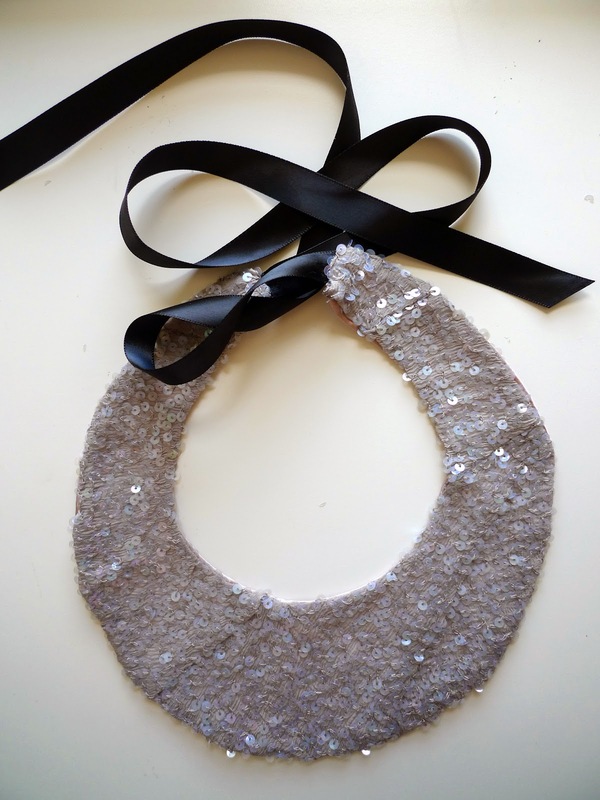 With this one, you won't burn a whole in your scrap heap but you can reincarnate some favourite fabric - in a fun collar or fabric necklace. I used some scraps of sequins fabric and pink satin from a previous dress, that I couldn't bear to throw away. First, I sewed the scraps together in kind of a a slapdash patchwork quilt manner, to create a full piece to cut a template out of. The seams create an abstract effect which I think in a way is nicer than cutting out of a complete piece. It would be fun to use different pieces of fabric too. I used my blocks as a template to trace a neckline. When I was satisfied with the shape I added my seam allowance. 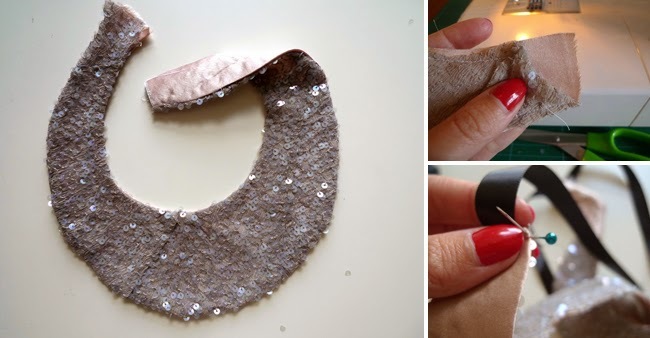 You don't need to use a block - you can trace the neckline of a favourite bodice pattern or draw one freehand, testing to make sure it lays flat around your neck. 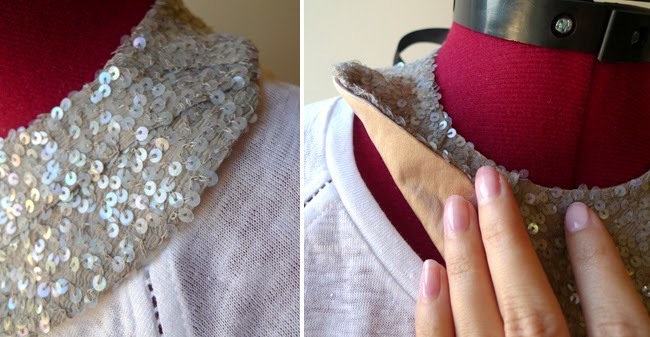 Dropping the top of the neckline by a few centimetres will give you more of a necklace effect opposed to a collar. One thing to remember - bear in mind the thickness of your fabric and give yourself enough space at the ends to pull the piece right side out - see below. I cut out two pieces, and added interfacing to the satin fabric on the back. Next you need to sew them right sides together, along to two long edges, in order to pull the piece right side out through the ends. If you don't have enough space to do this, remove a few stitches as I've done below, which you can restitch by hand later. Sew on a ribbon or other form of closure. Cute!!! 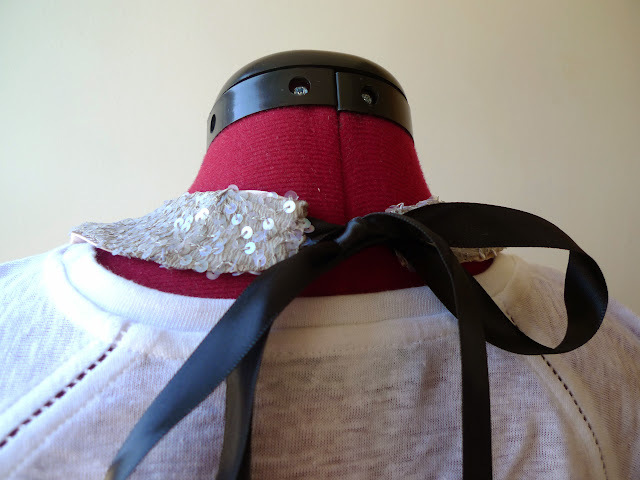 I love this kind of collar, thanks for sharing! Oh what a great idea!! 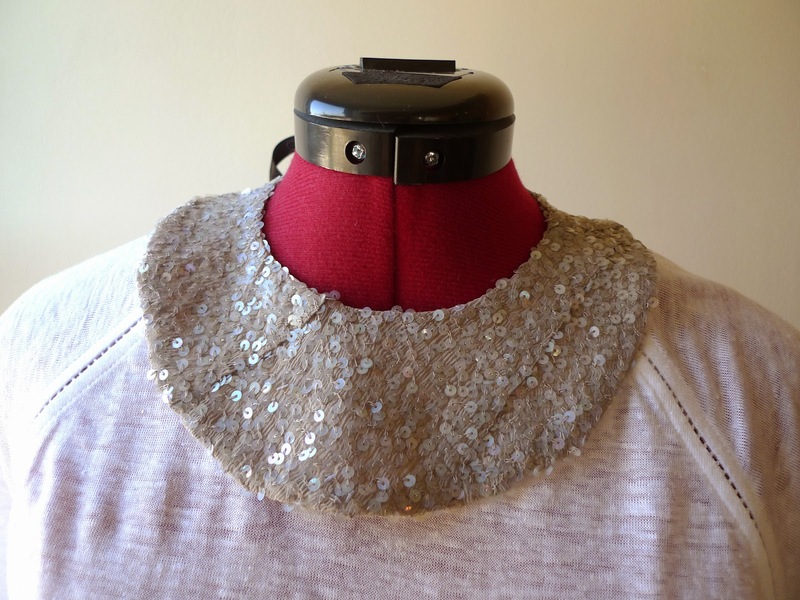 Lovely ;) and I've just pictured it in a mock PeterPan collar shape - so, to follow your tutorial but have a gorgeous temporary collar for plain tops! A tad more difficult, but worth the challenge perhaps for using some gorgeous scraps! Thanks Elise! Oooh a Peter Pan version with a plain top sounds fabulous - can't wait to see!